Silicon Valley is known for nurturing start-ups in a way no other place can. But it’s not all kumbaya here. 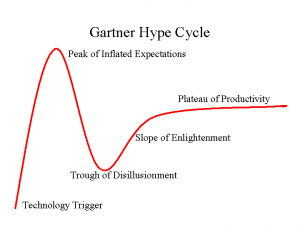 And one of the most destructive things about Silicon Valley is the hype cycle. And judging by the fact that some bloggers pronounced Twitter “done” the same week the company was featured on Oprah, it’s clear that hype cycle has spun ludicrously out of control. I’m sure you’ve seen the graphs. If not, it’s to the left. In words: A company comes out and no one likes it. It starts to attain huge growth and buzz. Suddenly it’s anointed the Messiah. Then something happens. A long time ago, that something was negative: A founder leaving, a down-round, growth that tailed-off or an inability to serve customers. Even then it wasn’t necessarily deserved, but the backlash would begin immediately. This company was a laughing stock. What was wrong with them? They’d lost it. They were toast. Well….for another few years. During which a good company would keep growing. And only later, would they get the true credit for what they’d built. Of course, “experts” would claim they got it all along. A great example is Google—a lauded company that was dismissed when it wouldn’t immediately monetize with banner ads in the wake of the bust, then re-anointed when the numbers came out at the IPO, and it began its surge past $700 a share. But the hype cycle isn’t confined to companies. It can describe waves of technology – like social networking, RFID or the consumer Internet itself—or people. One of the first examples I saw in the Valley was Marc Andreessen. He was built up as the young, shoe-less God of the Internet that the press brutally tore him down once the crash changed the viability of his second company, Loudcloud’s, business. It’s still deemed a “failure” in some corners of the Valley, never mind that it was painstakingly retooled as Opsware and sold for about the same amount as YouTube. People not only trashed the company, but they retroactively trashed Netscape, and Andreessen himself, saying he’d exaggerated his contributions to Mosaic. Of course, Andreessen kept his head down and kept working. Today he’s widely regarded as one of the most important mentors and angel investors of the Web 2.0 movement and one of the only people to found two companies that would end up being worth more than $1 billion each. Sure a smug “I told you so” as you count your millions is the best way to silence and embarrass naysayers; it’s the ultimate revenge. But start-ups can take a while to reach their final destination—whether that’s bankruptcy or an IPO. Forget cold, in the Valley revenge is a dish served molding and with flies swarming around it. There’s an element to the hype cycle that reflects human nature. We get excited about technology and tend to overestimate what it can do in a year and underestimate what it can do in ten years. That’s not all bad: Being underestimated is why a lot of start-ups catch giant companies off guard. But the blogosphere has turned an already frustrating hype cycle manic. The famous example was Cuil—a company lauded in the morning as a “Google Killer” and trashed before our first cups of coffee got cold. Not quite as extreme is what we’ve seen with the giants of Web 2.0: MySpace, Facebook and– believe it or not– the three-year-old Twitter. As soon as Facebook launched its platform—as if in unison—the media world decided MySpace was a has-been and Facebook was the king. Sure, Facebook is poised to overtake MySpace in the U.S., but by many accounts MySpace is making more money, increasing engagement and is still one of the largest sites on the Web. That should count for a lot. In the last month, it’s been happening to Facebook, and it’s even more absurd. The company is still growing, having passed the 200 million or 250 million user mark, depending on who you believe. And other reports, and my own sources, say the company is doing close to a $500 million revenue run rate. Did I mention we’re in an epicly bad recession? How is that a failure? Well said. Guess what, gang? Building a company is hard. No one gets every single thing right. Bloggers harping on each mistake are like the fat guy sitting in the bleachers at a baseball game berating a star player for not hitting a homerun in every at bat. Sure, Facebook’s valuation is coming down from $15 billion. But that was never a realistic valuation for the company. It wasn’t even paid by traditional venture capitalists; it was paid by Microsoft and other strategics looking to get a piece of the hot company and not caring what it cost. The company itself didn’t value Facebook at $15 billion when insiders sold stock. But is it worth $1 billion or more? Definitely. Even based on a reasonable multiple of revenues. Of the Web 2.0 wave you can count on one hand the companies that can claim that with a straight face. Look, we all do it to a degree. We fall in love with technologies, and readers and editors suddenly get an insatiable demand for stories about them. It’s reporters’ and bloggers’ jobs to give them what they want, right? But that tips into link-baiting, blindly aiming for that TechMeme traffic and writing a provocative headline that the story doesn’t even necessarily back up. It’s one thing to be the early adopter who gets bored once something is mainstream. It’s another thing to write off a company for the sheer fact that it’s successful, and you’re bored writing about it. Here’s the thing: Great start-ups can survive the hype cycle. Horrible companies were going to fail anyway. That may leave some marginal ones in the middle, but let’s argue if the press tanks a company, it wouldn’t have gotten far ultimately. So maybe the hype cycle doesn’t really do any harm. But who does it help? As bloggers and reporters we’re supposed to bring people reality and truth. No phase of the hype cycle is reality: Not the messiah, not the goat simply because big press has grown weary of the topic.